Despite a very long day of back to back shows, I dragged my tired yet fabulous self back downtown to the Soho House for the Mulberry Spring 2011 after-party. We danced around to music from DJ Dan Williams, before a live acoustic set by Florence Welch of Florence and the Machine. Her performance gave me goosebumps. That girl can sure sing. 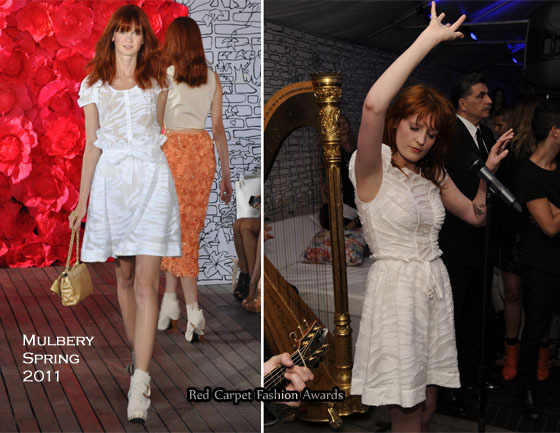 She was wearing an ensemble straight from the Mulberry Spring 2011 runway for her performance. Her white jacquard blouse and gathered skirt was paired with black ankle boots and ankle whites. Kelly Osborne wore the same dress, but of course the child of the Prince of Darkness wore a black version. Black, white and grey brogues completed her look. Other guests included Alexa Chung, Alexis Bledel, Dree Hemingway, Olivia Palermo in Tibi and Gemma Arteton. Towards the end of the party, some party goers fell/jumped into the pool much our amusement.